This cookbook is probably a great find for vegetarian families — since all of the recipes, geared to preschoolers, are vegetarian — but for vegans like us, it was a bit of a disappointment. Mollie Katzen’s recipes look good, but nearly every single one incorporates non-vegan ingredients, including eggs, dairy, and honey. That said, we did try one of the recipes, substituting soy yogurt for the dairy in the Chewy Power Circles, and my daughter loved following the step-by-step illustrations. She also devoured the end result! If only the recipes weren’t so explicitly not vegan, I might have run out to purchase this book for my family. 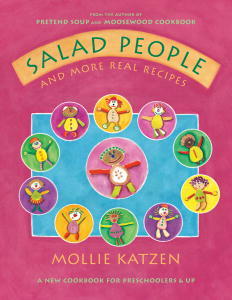 As it is, I returned the copy of Salad People to the library, with a sneaking suspicion I may borrow it again soon. Ages 3-7, with adult help. A few weeks ago I was ecstatic to listen to a vegan-themed show on NPR that featured Isa Moskowitz, one of my fave cookbook authors. For whatever reason, they had Mollie Katzen on and she was a complete let down. Granted she was a vegetable and vegetarian entrepreneur in this movement’s heyday, but she’s not veg anymore. I no longer support her since there are dozens of amazing chefs out there publishing books, some even for kids, with even better palates (in my humble opinion). Maybe we can rally to get Isa to make a kid’s cookbook?! Yes, I would buy an Isa kids cookbook in a heartbeat. Vegan with a Vengeance, Veganomicon, and Vegan Cupcakes Take Over the World are among my favorite cookbooks, but a kids cookbook would send me over the moon! I heard that show too! I was interested to listen to it because I know that there is Mollie Katzen backlash in some parts of vegan communities. She is not a vegetarian or vegan yet she has crafted books that make vegan living more delicious, and inspired many veg*ns throughout the decades. I remember that in the interview, Isa Chandra Moskowitz ended up crediting Mollie Katzen as an inspiration to her despite their pronounced differences in ethics and eating.